* All classes cost $100 + materials fee unless otherwise noted. * Curious about materials? I try to provide most of the materials you will need for a class with the exception of sewing machines, bobbins, threads, some tools and the like. If there is a particular material I need you to provide, I will send that information to you once you register. *** Interested in a Class or a Studio Play Day? If you are interested in a class that is not currently offered, get some friends together and we will try to schedule it at some mutually agreeable time: just contact me. Do you need space, inspiration, a break from your own studio/work space? Want to hang out and work with around other creative folks in the same situation? Want to work on one of those unfinished projects? Questions about materials/supplies? ITSA Studio is available for just those situations. A variety of supplies will be on hand for your use, others are available for purchase, and light snacks & beverages will keep you going. Not a class, but chance to get fresh eyes and input on your projects. I teach many types of classes, and am developing more all the time. If you see something that strikes your fancy, get some friends together and we will schedule a day of instruction. All classes cost $100 + mandatory materials fee (usually between $15 - $25). 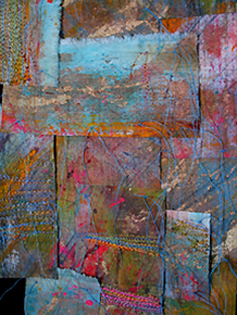 Using gel medium (acrylic) and fibers (paper, images, fabrics, embellishments, threads/string etc.) 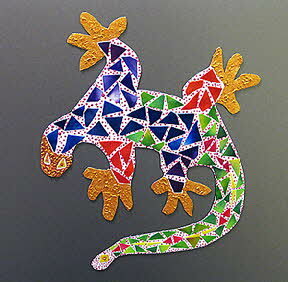 you will experiment with creating 2D mosaics. bits and pieces while creating a wonderful art piece at the same time. Using powdered glue and other tricks you will have an interesting piece that stands alone or can be incorporated into other work. Little critters made with leftovers and embellishments. Can be machine stitched or sewn by hand. Your imagination is the only limiting factor in your Bugga collection. Wool, water, warmth, and a little pressure...and a plastic bag to contain the water and make cleanup easy. Good for small projects; size depends on bag used. Oh, my...we all have one don’t we? In this class you get the chance to give yours an actual physical form. Using scraps and embellishments, you can just have a little crazy fun. The egos can be machine stitched or hand sewn. Using some type of box, armature or ??? 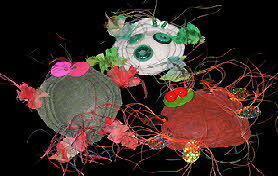 you will create a piece using all sorts of bits and pieces of ‘stuff’. Glue them on, tie them on, stitch them on...the ideas are limitless. 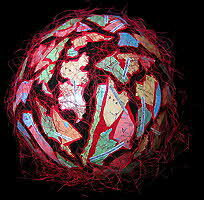 Using papers, fibers, plastics or whatever, as well as glue, you will create a collage that expresses you-in-the-moment. There are sooooo many! We will explore some and probably come up with a few of our own. You will be making samples of different sorts of techniques so when you go back to your own workspace you can get busy! 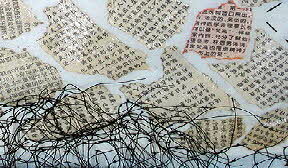 Making ‘paper’ out of silk (and other fibers) is pretty cool. Learn this simple technique that can be used in bookmaking, decorative arts, collage and more. Not a real Slinky, but just as much fun! 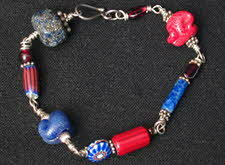 You will create a bracelet (and a ring) using this fun wire jewelry supply and lots of beads. Students will explore a few styles of drop earrings, and maybe a couple of other styles as well. You will learn about making loops, balance, and some other tricks of the trade. A favorite of mine and of my students, caging is just too much fun, and allows you to be very expressive on a small metal ‘canvas’. 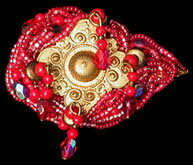 You will make a pin suitable for wearing on a heavy coat or maybe a funky hat. You will learn to make very lightweight felt by felting into a sheer base fabric. You will make samples or small wall hangings or ??? You will not be doing any dyeing in this class. 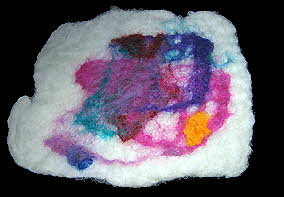 This type of felting is suitable for clothing, art pieces, decor art etc. 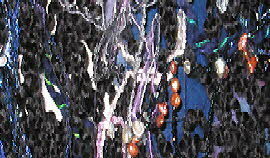 Learn to create thread webs using old threads, yarns, strings, fabric scraps, and anything that can be stitched and immersed in water. 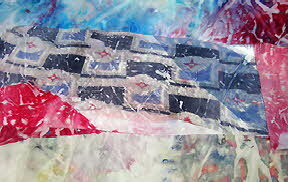 Using water soluble laundry bags, you will explore this fun and versatile technique. This class requires a sewing machine, a universal foot for straight sewing; Teflon foot highly recommended, darning foot optional. Using gel medium (acrylic) and fibers (paper, misc. 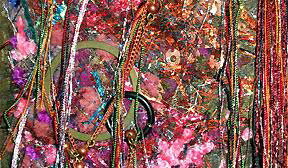 images, fabrics, embellishments, threads/string etc.) 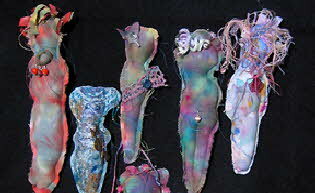 you will experiment with creating mosaics on a 3D form/armature. You will start (and perhaps finish!) 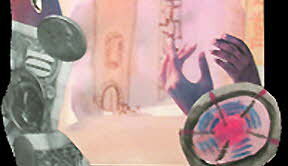 a 3D piece in class. Can’t find what you are looking for at the card shop? 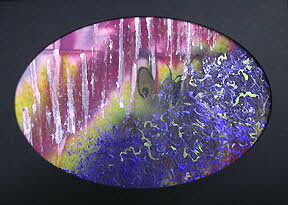 Make your own using techniques you will be introduced to in this fun class. These frame cards are also a great way to show off your creations. Using magnetic sheets that you will cut out in any design you wish, you will make silly, funny, enchanting, or serious magnets. 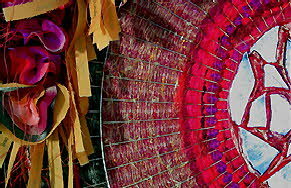 Use papers, fiber, beads, various mixed media supplies to create your unique images & decorations. 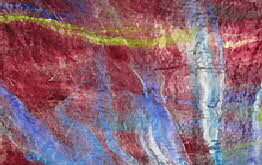 The dyes/patterns in silk ties love to transfer to another piece of silk. 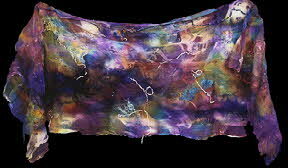 You will use this process to dye a silk scarf or other silk fabric. The process in this class gives of fumes, if you are sensitive, this indoor class is not for you. 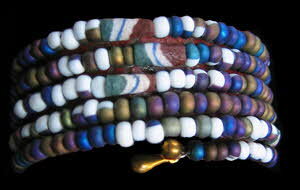 We will explore some additional styles of bracelets in this class. Students will learn about making loops, articulation, balance and other tips.